Developers boast they will make billions of euro for the country and create tens of thousands of jobs. But opponents demand to know where this mass employment will come from as the turbines are all made abroad and once erected are remotely controlled from places like Germany and Denmark. The most contentious plan of all is to bring a staggering 2,000 turbines to five midland counties and offshore locations to make power for the UK – because Wales refused to have them. Two companies, Mainstream Renewable Power and Element Power, are currently signing up landowners across Offaly, Tipperary, Laois, Kildare and Meath to allow the towers on their land, following the signing of “a memorandum of understanding” between the Irish and British governments in January. Once up and running, all the power created will be sent directly to the UK. The news has sparked the launch of a wave of protest groups to protect the rights of local communities. Most say they are not against windfarms, but want turbines built away from homes and with proper consultation. In Co. Cork, seven households have taken the unique step of suing local developer Enercon Services for driving them out of their homes. Life became so tough for the Banteer residents that they quit their properties 18 months ago and never went back. The landmark case could set a precedent for multiple actions in the future. Another couple in their 60s were temporarily forced out of their home near Roscommon after becoming traumatised by the lack of sleep. Michael and Dorothy Keane now plan to move to rented accommodation. Dorothy said they had moved to their rural home for a peaceful retirement, but the constant humming inside their house drove them demented. The Keanes are furious that An Bord Pleanala gave permission for the windfarm at Skrine Hill with no noise level conditions. “It’s outrageous. If anyone else makes noise you can ring the police, but windfarm companies have carte blanche to do what they like,” said Dorothy. In Kilrush, Co. Clare, Astrid Adler said her health had suffered from the Monmore Windfarm 750m away and she now regularly hyperventilates. “There are seven turbines, but they want to build 45 more.We would leave, but nobody would buy our house,” she said. Philip Hickey (51), lives just 370m from one of six turbines erected in Ballylusk, Co.Wexford, in breach of planning rules which stipulate they should be a minimum of 500m from homes. “We have to listen to it all day. This was our dream home but they have ruined it,” said Philip. Campaigner Yvonne Cronin, of Moycullen, Co. Galway, said 103 turbines had been given planning permission within an 8km radius of her house and 17 were currently being erected. She said 60 per cent of the land zoned for windfarms by the council was in densely populated areas. Yvonne said her group had found 14 breaches of planning rules which should have ruled out planning permission. She said the council was interested only in money – €8,000 per turbine in planning fees and €18,000 in rates for the next 15 to 20 years. Meanwhile, the Lakelands Windfarm Information Group (LWIG) has been set up to fight the Midlands development. Spokesman Andrew Duncan said it would be the biggest windfarm in Europe, with the tallest turbines, and would cripple local property prices. And all for the benefit of the UK. The new turbines will be a massive 185m (610 ft), with 75 ton blades, requiring 1,000 ton concrete bases, the size of an Olympic swimming pool. Landowners were being offered a €1,000 signing on fee, another €10,000 when planning permission is approved and €18,000 to €24,000 annual rent once a turbine begins producing power. LWIG claims the windfarms will split communities because landowners get the cash, but locals have to live with the consequences. It said claims that 40,000 jobs would be created and the country would make billions were laughable. The LWIG believes the companies will sell off the development once planning permission is acquired and won’t be involved in construction. “Windfarms should be put in appropriate locations with proper planning to protect communities,” said Andrew. 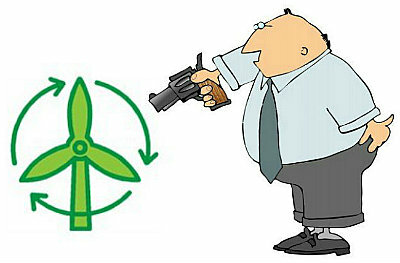 The action group called for a moratorium on windfarms while the government reviews its outdated 1998 guidelines. A report is due at the end of the year. A Mainstream spokesman said yesterday that the sale of 5,000MW of energy to the UK would be worth €2.5 billion. And he said the aim would be to build the giant turbines in Ireland by persuading foreign manufacturers to open a plant here. “Once we know where we want to build the windfarms we will start an environmental impact assessment and will go out to every area to hold information days,” said the spokesman. At last, we hear a multitude of voices on the wind….. as the masses are denied sleep, the masses awake. We must all raise our voices together to stop this insanity.